This article reviews the proposed economic policies of President Ma Ying-Jeou during his campaign, Taiwan's economic performance in the past two years and the related economic policies that have been carried out. In addition, the future economic blueprint is outlined by linking his campaign pledges and recent policies. Regarding President Ma's economic plans, this article considers (1) the "6-3-3" policy target can be possibly reached; (2) to achieve the goal, the original plan included four faucets: 12 basic infrastructure projects, Global connection, Industry restructuring and Tax reform. Though President Ma announced a comprehensive strategy for Taiwan's economy during the campaign, he faced a series of economic and political crises soon after assuming his presidential duties, including removing the gasoline price freeze, eruption of the global financial tsunami, the Sanlu contaminated milk powder incident, and the disaster from Typhoon Morakot. Consequently, most of the first two years of his term centered on crisis management. The global economic developments during that time made the "6-3-3" campaign pledge to be seemingly unattainable. Among which, the financial tsunami was the greatest among the crises. Accordingly, this article will elaborate on the economic policy measures that were introduced in coping with the financial crisis. Separately, as the global economy started to recover in the second half of 2009, coupled with the proper measures taken during the recession, the Taiwan economy was able to weather the recession and head towards a path of recovery. Given the gradual recovery in the economy, the economic policies of the Ma administration may shift towards a more long term economic perspective from the previous crisis management mode. Hence, this article will also elaborate on the future economic blueprint. The conclusions are as follows: (1) Connecting both sides of the Strait, Envisioning the world and Internal economic development is the core policy of Ma's administration, (2) within this framework, the Asian supply chain development model has already become the major driving force of economic development in Asian nations, which is a trend Taiwan can not resist, (3) joining the international division of labor aggressively will force industries at a disadvantage to relocate, thus causing unemployment. Under these circumstances, Ma's administration will respond in three different ways: industrial innovation, deregulation, and develop emerging industries. The current economic policies appear to be following such a mindset. This paper is separated into three sections. The first is a description regarding President Ma's campaign pledges; the second addresses the Taiwan economy since Ma took office. For this section, the paper delineates the crisis he encountered when he took office and the measures that were adopted in handling them. Finally, the third portion provides some viewpoints regarding the prospect of Taiwan's economy. President Ma's economic policy prospects during the campaign mainly centered on the "6-3-3" pledge, a vision of what Taiwan would become under his governance. Specifically, "6-3-3" means an average annual economic growth rate of 6 percent or more; unemployment rate lowered to 3% percent or less before 2012; per capita income reaching $30,000 USD before 2016 (Figure 1). To achieve his goals, his economic blueprint had four dimensions: 12 basic infrastructure projects, Global connection, Industry restructuring and Tax reform. The reason behind the 12 infrastructure projects was due to the long term sluggishness of the domestic demand. In addition, during Ma's election campaign, most of the major economies were showing signs of weakness and the possibility of slipping into recession. Hence, he believed that the future administration must increase public investment to enhance domestic demand. The mindset behind his global connection policy is that, for a long time foreign trade has been the lifeline and source of vitality of Taiwan. Although Taiwan joined the WTO in 2002, given the minimal progress of the Doha round, the trend of global free trade has transformed into respective regional integrations. In light of the political reality, Taiwan was unable to directly participate in many international economic activities. As Taiwan greatly relies on foreign trade, the danger of becoming marginalized has steadily grown. Therefore, during Ma's campaign, global connection was a core dimension of his future economic policy. As for the industry restructuring policy, he hopes to gradually upgrade Taiwan's industrial sector through incentives and deregulations in coping with the challenges of globalization. Lastly, the goal of tax reform is to deal with the problems regarding Taiwan's income tax being over-concentrated on salary receivers, and unfair tax rates between different industries. 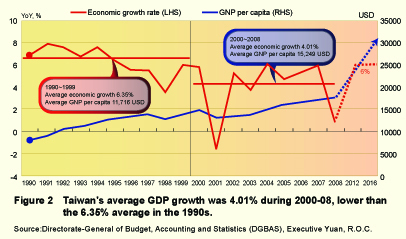 Figure 2　Taiwan's average GDP growth was 4.01% during 2000-08, lower than the 6.35% average in the 1990s. Source:Directorate-General of Budget, Accounting and Statistics (DGBAS), Executive Yuan, R.O.C. Although during the campaign, his "6-3-3" target faced enormous suspicion, such goals were not unreachable. In fact, the logic behind "6-3-3" is that Taiwan's economy may return to the growth momentum it once enjoyed in the 1990s. During the 1990s, the average annual GDP growth was 6.35%, which is significantly higher than the 4.01% average during 2000~2008. If Taiwan's economy can grow at an annual 6% with a 2% annual inflation, based on Taiwan's per capita GDP of 17,507 USD in 2008, Taiwan's per capita GDP could top 32,000 USD in 2016 (Figure 2). In fact, if Taiwan's economy can grow by more than 6% annually, the unemployment rate can drop to the late 1990 levels, which is 3% (Figure 3). 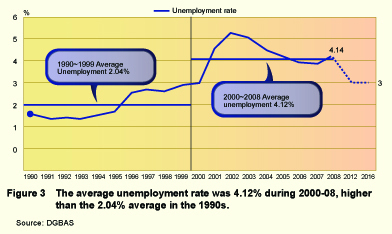 Figure 3　The average unemployment rate was 4.12% during 2000-08, higher than the 2.04% average in the 1990s. Though President Ma was keen in promoting the "6-3-3" vision during his campaign, the challenges he encountered after taking office rendered such a realization to be nearly unattainable. The first challenge that Ma's administrative team faced was lifting the gasoline price freeze that was in place since Nov. 6 of 2007 and allowing it to be exposed to the actual market mechanisms. Noteworthy, due to the removal of the price freeze on May 30, 2008, Taiwan's CPI inflation once hiked to 5.81% in July 2008 (Figure 4). In addition, owing to the rise in international commodity prices, a key focus was containing the inflation in the initial periods of Ma's administration. 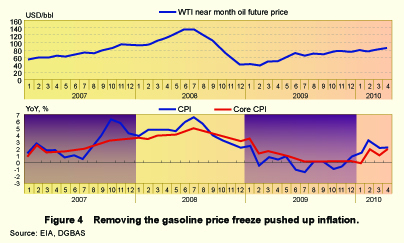 Figure 4　Removing the gasoline price freeze pushed up inflation. Although international commodity prices fell sharply since July 2008, a bigger sub-prime turmoil and the following financial crisis seriously struck Taiwan, which has always relied heavily on external demand. Noteworthy, the correlation coefficient of Taiwan export annual growth and the world trade volume annual growth during 2000 thru 2010 has been at a high of 0.87. This naturally explains why Taiwan's exports fell sharply by 9.21% in 2009 (Figure 5). 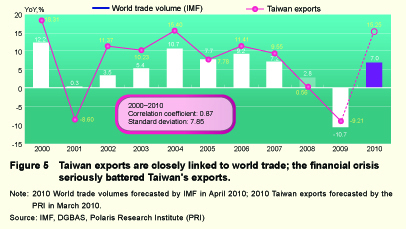 Figure 5　Taiwan exports are closely linked to world trade; the financial crisis seriously battered Taiwan's exports. The sharp export declines significantly impacted Taiwan's manufacturing industry, which dragged Taiwan into a recession for 5 consecutive quarters. The trough seems to have occurred during 1Q09, when the GDP declined 9.08% year-on-year. Amid the deepening recession, the unemployment rate worsened as well, rising from 3.84% in May 2008 to 6.13% in Aug 2009 (Figure 6). Figure 6　The economic recession and rising unemployment rate. In addition to the crisis of lifting the price freeze and eruption of the global financial crisis, the Sanlu contaminated milk powder event of Sept. 2009, the H1N1 flu pandemic of Mar. 2009, the disaster inflicted by Typhoon Morakot in Aug. 2009 and the internal controversy over the agreement to loosen the limits on US beef imports all contributed to the drop of President Ma's approval rates, resulting in Ma's administration to be unable to focus on realizing his campaign prospects (Figure 7). 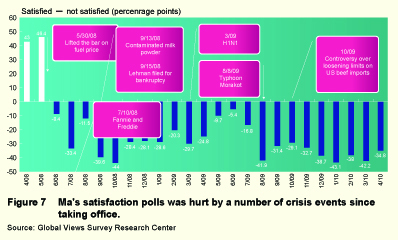 Figure 7 Ma's satisfaction polls was hurt by a number of crisis events since taking office. Ma's team faced hiking oil prices and the eruption of the global financial crisis soon after taking office. In response to the oil price hikes, the government introduced various stimulus and financial stabilization policies. First, the oil price freeze was lifted, allowing it to return to the normal market price mechanisms. Meanwhile, subsidies were introduced for specific seriously impacted industries and low income households. But most of the effort concentrated on the stimulus policies in weathering the financial crisis. The policies covered four aspects, which were fiscal, employment, monetary and finance, and tax reform policies. The fiscal policy not only focused in expanding public infrastructure, a 3600 NTD per person consumption voucher was introduced prior to the Chinese New Year of 2009, which enhanced the domestic demand of Taiwan. Employment policy was divided into short term employment programs and vocational training to help retain relevant working skills, as jobs were unfortuantly cut. The slogan of monetary and financial policy was "Three Supports", which meant the government supported banks, banks supported firms and firms supported workers. A significant share of Taiwan's industrial structure was SMEs and they provided a large portion of the employment opportunities. But most of their finances were from bank loans. If banks tightened credit in light of the financial crisis, unemployment matters would worsen and thereby deepen the recession. Therefore, during this period, the government provided full deposit guarantee to prevent bank runs due to depositors' fear over solvency, while the central bank beginning on Sept. 18 of 2008 lowered the interest rate for 7 times to a historic low of 1.25%. Finally, in terms of the tax reform, through bequest and gift tax reform, Ma's government attracted back funds held overseas by Taiwanese people. In addition, through income tax reform, it helped make the domestic burden of tax fairer (Figure 8). Figure 8 Policy responses to the financial crisis. Benefiting from the sprouts of recovery in the global economy and the government stimulus package taking effect, the Taiwan economy started to recover in 2Q09. More importantly, with the recovery gradually getting back on track, the DGBAS has for four times revised upward the forecast of Taiwan's economic growth for 2010 since Aug. 2009 (Figure 9). 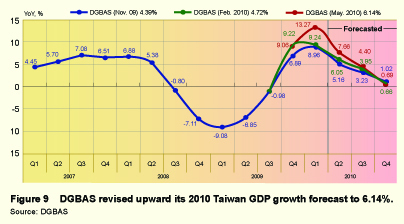 Figure 9 DGBAS revised upward its 2010 Taiwan GDP growth forecast to 6.14%. Aside from the DGBAS, recently other major institutes have also revised upward their Taiwan economic growth forecasts. Among which, Global Insight raised their forecasts for Taiwan's growth in 2010 to 6.6% on June 2010 from the 5.3% on May 2010, and the Polaris Research Institute revised upward its forecasts for Taiwan's growth in 2010 to 6.82% on June 2010. The ADB and the IMF also further lifted their forecasts to 4.9% and 6.5% respectively, on April 2010 (Figure 10). Figure 10 Major Institutes revised upward 2010 Taiwan Economy Forecast. 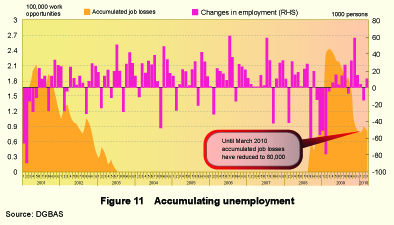 Battered by the recession, the number of accumulated job losses amounted to 238,000 people from Aug 2008 to April 2009. But thanks to the gradual recovery that started in 2Q09, the number of accumulated job losses fell to 80,000 people, which marked a big improvement. Although the unemployment rate remains high, conditions have improved evidently (Figure 11). It should be noted that, the policy measures and their success come at a cost. Although Taiwan is gradually recovering from the impact of the global financial crisis, it still faces the challenge of long term increasing public debt resulting from policies made in response to the crisis. Noteworthy, the government deficit to the GDP ratio was 3.8% in 2009, the highest since 1995. This caused the government debt to GDP ratio to increase to 33.1% in 2009 from 29.8% in 2008 (Figure 12). Amid the gradual recovery of the economy, we can expect the economic policy of Ma's government to return to a more longer term perspective. If we review President Ma's campaign promises and recent policies, we can find that the core of Ma's economic policy is on balancing internal and external developments. On the external side, policies include aggressively pursuing ECFA with China and signing FTAs with major trade partners to reach the goal of "Connecting both sides of the Strait, Envisioning the world." On the internal side, industry upgrade is achieved by tax reforms, supporting selective emerging industries and deregulations (Figure 13). 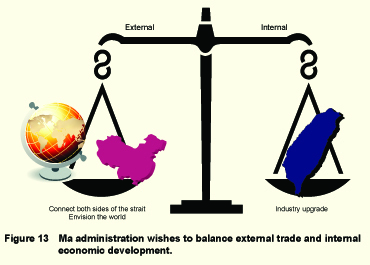 Figure 13　Ma administration wishes to balance external trade and internal economic development. These two policies are both vital to Taiwan. Afterall, in the pursuance of freer trade, based on comparative advantage considerations, the migration of various labor intensive industries is a natural outcome. However, if Taiwan can at the same time take advantage of the expanded overseas market space and aggressively support industrial upgrade and play critical roles in the global supply chain, it may prove to be beneficial to the sustainable development of the island. In further detail, as international trade becomes more convenient, division of labor among exporting industries have grown increasingly apparent, where such division of labor is most efficient in Asia. Asian nations import high value added ingredient materials and machinery from Japan, and the NIEs (Taiwan, South Korea, Hong Kong and Singapore). They facilitate their comparative advantage by producing the intermediate components required to make the final goods, and subsequently moving them to China and the ASEAN for final assembly. After the final goods are manufactured in the emerging Asia economies, not only are they sold back to neighboring Asian nations, but also to the major markets of the US and Europe. 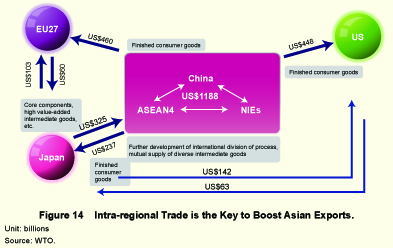 Such a production system is a key reason as to why Asian trade has flourished in recent years (Figure 14). Figure 14 Intra-regional Trade is the Key to Boost Asian Exports. Noteworthy, by comparing the export destination of major economies, we can see the prosperous development of the manufacturing process division among Asian nations. In terms of Asia as a whole, intra-Asia trade has accounted for over 57.5% of total trade. Although slightly lower than the 67.2% of the European Union, it is 11.9 percentage points higher compared to 1990, and is much higher than the -0.3 percentage point change in the EU and the 8.1 percentage point increase in NAFTA over the same period. Among Asia, the share of NIEs and Japan exports to Asia have reached 63.6%, which is a 20.1 percentage point increase from 1990, thereby showing that these nations have actively joined the intra Asia manufacturing process division (Chart 1). 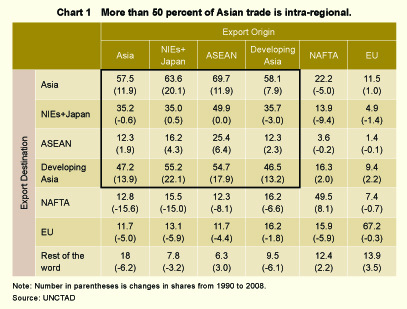 Chart 1　More than 50 percent of Asian trade is intra-regional. If we further look at the structural change in intra-Asian trade, we can see that China is the key influencing factor. 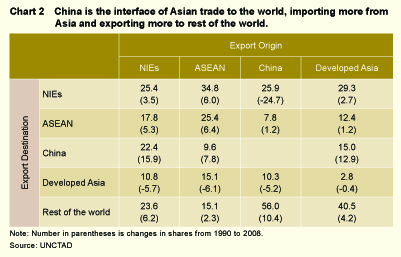 In 2008, exports to China increased the most compared to 1990 from all the NIEs, ASEAN and developed Asia (mainly Japan), where the share increased by 15.9, 7.8 and 12.9 percentage points, respectively. In Refocusing on the internal side, aggressive participation in the process of global division of labor will inevitably cause some industries with comparative disadvantages to move out. Since many of these are traditional manufacturing industries that employ a great number of workers, the government must take the issue seriously or it may cause panic over unemployment concerns. 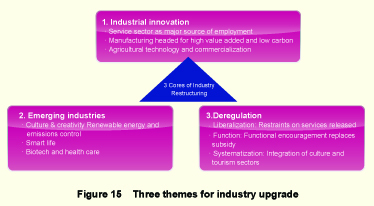 To cope with the challenge, Ma's team has planned three dimensions for industrial restructuring: industry renewal, emerging industries and deregulation (Figure 15). Among which, there are two goals in industry renewal, which is: 1. Upgrade of the service sector to absorb the excessive labor during the process of industry transition; 2. Increase the added value of manufacturing industries and developing agricultural technologies to cope with the competition from nearby countries once trade is freer. relative terms, during the same period China's exports to the rest of the world grew much faster than the exports to Asia, where in 2008 the export share to areas other than Asia reached 56% of total exports, amounting to a 10.4 percentage point increase in contrast to the 1990s (Chart 2). To sum up, as the development of the Asian supply chain system has become the main driver of export development for all Asian nations, Taiwan cannot exclude itself from such a system, and moreover, Taiwan should actively participate in such a process. Chart 2　China is the interface of Asian trade to the world, importing more from Asia and exporting more to rest of the world. Refocusing on the internal side, aggressive participation in the process of global division of labor will inevitably cause some industries with comparative disadvantages to move out. Since many of these are traditional manufacturing industries that employ a great number of workers, the government must take the issue seriously or it may cause panic over unemployment concerns. To cope with the challenge, Ma's team has planned three dimensions for industrial restructuring: industry renewal, emerging industries and deregulation (Figure 15). Among which, there are two goals in industry renewal, which is: 1. Upgrade of the service sector to absorb the excessive labor during the process of industry transition; 2. Increase the added value of manufacturing industries and developing agricultural technologies to cope with the competition from nearby countries once trade is freer. In addition to the industries where Taiwan has a strong competitiveness, the government has also laid out plans for the recreation and culture segments, green energy and low emissions sector, smart living industry, and biotech and health care sectors to serve as Taiwan's long term industry development. To make this achievable, in addition to the subsidies given to specific industries by the Executive Yuan, the more important task is to deregulate relevant restrictions. Another aspect of deregulation which recently has become a frequently discussed issue is the tax reform. The planned tax reform has four dimensions (Figure 16). In addition to the previously mentioned income tax and bequest and gift tax, in the newly passed corporate profit tax reform, the industry specific grants were replaced by functionality based subsidies that provided incentives for investment. In addition, the corporate profit tax rate was lowered to 17% from 25% to enhance international competitiveness. The government has also planned for a green taxation system for the future to promote Taiwan's development in green technology and low emissions industry. 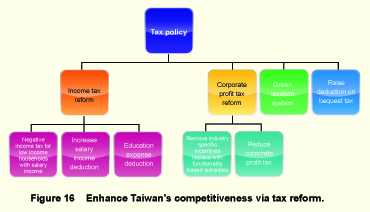 Figure 16 Enhance Taiwan's competitiveness via tax reform. The financial crisis could have a lagging effect on Taiwan. According to estimates by the PRI, the crisis has lowered Taiwan's potential GDP growth rate by 1.92 percentage points. In other words, the average potential economic growth rate in 2010~2012 would be a mere 3.9%. However, if the economic policies can take effect and provide new growth potential to Taiwan's economy, its potential economic growth rate may return to pre-crisis trends, which would be an average of 5.9% for 2010~2012 (Figure 17). 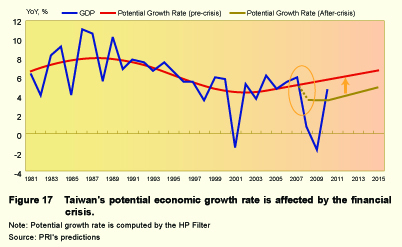 Figure 17 Taiwan's potential economic growth rate is affected by the financial crisis. In fact, IMF has been holding a more optimistic view among currently available opinions regarding Taiwan's economic growth for the next few years. According to the World Economic Outlook report it released in April 2010, Taiwan's average growth rate during 2010~2015 is projected to reach 5.20%, higher than the projections for Singapore, Hong Kong and South Korea for the same period, at 5.0%, 4.4% and 4.3%, respectively. Based on IMF's projections, Taiwan's per capita GDP could reach 28,000 USD and unemployment rate could fall to 3.1% in 2016 (Figure 18). 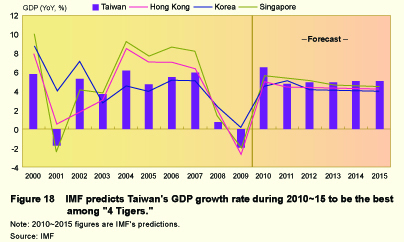 Figure 18 IMF predicts Taiwan's GDP growth rate during 2010~15 to be the best among "4 Tigers." * This paper is an updated version of a speech delivered on May 18, 2010 at the Brookings Institution, Washington D.C., USA for a Joint Symposium entitled "A Mid-Term Assessment of the Policies of the Ma Ying-Jeou Administration" which was organized by The Freeman Chair Studies at the Center for Strategic and International Studies, The Center for Northeast Asian Policy Studies at the Brookings Institution, and The John L. Thornton China Center at the Brookings Institution.